In my last few posts I outlined some of my thoughts about the tendency that most of us have of somehow mentally and emotionally stepping outside of ourselves. The way we do this is twofold. First we have developed a strong psychological habit of relentless inner commentary. Our minds have been trained to relentlessly provide accompanying commentary to everything we do. Second we have developed a second habit, equally strong, of identifying with a great deal of this commentary. We don’t experience this incessant self-talk as an automated function of the mind, we experience it as me talking to myself. For those of us thus afflicted – which is nearly all of us – the thoughts that end up in our heads dictate who we experience ourselves to be and then how we act, and ultimately who we are. In an earlier blog post I more or less explained that this conundrum was exactly why philosophy is not a luxury. Since the ideas we hold dictate our actions, and ultimately who we are, it is an utter necessity that we examine those ideas and find a way to either validate or discard them. Once we understand this fundamental mechanism of misidentification we can begin to explore some special cases where this error affects us in adverse ways. And one that I find most compelling and life altering is in relationship to our commitments. Most of us, at times, experience some difficulty, maybe lots of difficulty, holding to our commitments. We commit to something – a life change or a partnership perhaps – and later we find ourselves not following through on it and maybe even giving up on the commitment. How does this happen? How do we make a commitment and then not follow through on it? And perhaps more to the point, who made the commitment ? and who didn’t follow through on it? and are they the same person? Let’s say you make a commitment to a life change of some type. You adopt some form of healthier living, for instance. You probably make that commitment in a moment of inspiration, compelled by the benefit that that change offers to you and others. Later some aspect of following through on that commitment is difficult for some reason, and you fail to do so. You do something you vowed not to do, or you do not do something that you promised yourself or others you would do. Most of us at this point would say that the commitment we made to ourselves or to others has been broken. We would tend to think in terms of will, typically concluding that our will was too weak to follow through on our original commitment. And at that point we would either re-commit to our original intent or give up on it. Most of us would probably say that we broke our commitment when we acted against it. I would like to question that, or at least qualify it. Certainly if we act against our committed intention, we have broken that intention. But I am not sure it is most useful to assume we have broken the commitment, although that is what we usually do. That is what I would define as stepping outside of our commitment. What happens is that we commit to something, then we act against that commitment, then we assume we have broken the commitment and pressure ourselves to recommit. I believe that the step of assuming that we have broken the commitment is not helpful because, in that assumption, we are taking the position that we didn’t really commit and we therefore need to recommit. An alternative is to stay on the inside of our commitments even when we act against them. Yes, you acted against your commitment, but that doesn’t mean that you are not committed. You don’t need to recommit, you need to face the fact that what you committed to is more difficult to follow than you thought. Then you start acting in accordance with that commitment. There is no reason to step outside of the commitment and recommit. Our commitments can be final. We can be committed to something even when we discover that we have acted against it. The reason that this is so important is that when we step outside of our commitment, we open up the possibility of doubting that we were ever really committed in the first place. And anytime we do that we are tempting ourselves to give up on the commitment entirely. 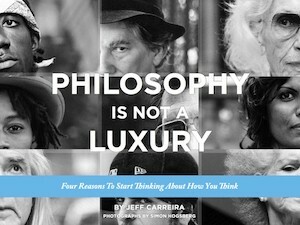 Please download my eBook “Philosophy is not a Luxury” as a gift in appreciation for your readership. Jeff, that is the most beautiful explanation of what it means to take responsibility for ourselves that I’ve ever read. It keeps us moving forward without always returning to step one i.e. making the commitment over and over again. Once it’s settled that it’s been made, that commitment is ours to own and we’re in new territory altogether. I’d love to hear more of your thoughts in this direction! Jeff, I tend to see our breaking of a commitment as a manifestation of our commitment to something else that is either unrecognized or forgotten. That experience we have all had that it is hard to hold to an expoused principle or value thereby becomes an illustration of our divided or complex nature and an invitation to investigate our conflicts and complexities. And that takes down the very uncertain road of conscious integration! I really appreciate this insight on how to deal with ‘breaking’ our commitments as it sheds light on the appreciation of what is needed to really follow up on them with humility and sincerity. either, it just means that we need to examine old and new commitments from as wise and detached posture as possible – and that may mean adjustments in one or another of our commitments. Your main point Jeff seems to have other positive implications for how we navigate through life. Thank you, Barbara W.
Thank you, Jeff, for this. I think it’s a subtle point with potentially huge ramifications. And also reveals how we needlessly complexify our lives. Ultimately, the kind of false thinking you pointed out leads us to even more self-absorption with our perceived flawed nature rather than simply getting back on track with more humility. I think this is extremely helpful and insightful. It draws on the more far-reaching principle that it is better to be gentle with oneself than hard on oneself. Our culture instills the opposite point of view – if you are not being hard on yourself you are seen as weak and spineless by others, which trains you to see yourself as weak and spineless for failing to take this position. This, in turn, creates a misunderstanding of what true gentleness with oneself actually means. It does not mean being flaky and saying “screw it,” as we are apt to believe. It means realizing that there is no point in making the situation harder to deal with and recover from than it has to be. By choosing to believe that we have failed we have already done violence to our psyche. This can lead to two negative outcomes: option 1) getting angry with oneself and using that anger as motivation to try harder, which of course means that love can no longer be the basis of one’s action in this department. 2) Failing to recognize that the pain of failure is self-inflicted and thus avoiding the source of the pain altogether in the future: the act of making any commitment in the first place. Thanks for this post, it really spurred some positive restructuring of my personal growth principles. Congratulations on this achievement of getting your thoughts all down in black and white and then offering it to us who’ve been following what you’ve had to say. Best regards, thank you, aloha, namaste !! I submit that the harder it is in efforts to make significant changes in your life and to stay committed to them, then your spiritual growth is that much more. Best regards to all for a happy and heartfelt Thanksgiving ! !